Synopsis: The planet Ethos is at war with a savage enemy known as the Splicers. Their only successful defense is the Prime Initiative. All newborns with the compatible genes to become primes are taken from their families and injected with the Prime Stimulus. Those that survive the stimulus develop extraordinary abilities and are conscripted into the Ethos Army for training. But each ability comes with a defect. After turning twelve, Aidan is moved to the upper-class at the Mount Fegorio training complex. But Aidan is different than the other primes. Not only does he have two abilities, but he has no defects, besides the fact he is unable to sleep. His special gifts allow him unprecedented success in the virtual training simulations, known as The Pit. Using his unique abilities, Aidan goes further than any prime in history by reaching the final simulation, sim 299. No one knows what lies after sim 299, not even Director Tuskin, the ruthless and reclusive ruler of their planet. But someone, or something, has been guiding Aidan there, waiting for him to complete sim 299. If he can pass the final tests, he may unlock the key to ending the Splicer War. I enjoyed this book! It’s a classic sci-fi set on another planet – but it’s also pretty unique, which I really liked! The plot…alternates between action packed and pretty laid back, which I liked, as it gave you a bit of a break in between fast-paced parts to relax and prepare for the next bit. It’s a great balance! The characters…are very well described. Twiss very well writes in a view of children and adults. I also think he does a brilliant job of describing Adain’s (and other people’s) almost magical powers in a way that is completely understandable to readers! The writing…is amazing! Not only does Twiss write very well in third person, but as I mentioned above, he also describes things brilliantly. Something I liked…I actually loved the beginning of this book! I say that very rarely, so it is definitely high praise indeed. I sometimes find it hard to read books because the start of books focus too much on one thing – character or scenery building is a classic one. 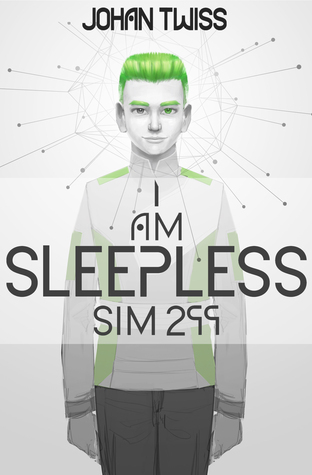 But I Am Sleepless: Sim 299 really excels in drawing you in and making you want to read more! Also special mention to Johan’s wife! She did a fabulous job of creating amazing drawings to go along with each chapter – which not only require a lot of skill, but really tie the book together in a totally unique but brilliant way. I admire you both so much! Something I disliked…I didn’t dislike anything, as such. The only thing I found is it’s pretty hard to read this book with distractions. The made up creatures, powers and even skin colour are great but you do need to focus to understand everything! My thoughts…considering this is a sci-fi/fantasy book, I was wondering whether I would enjoy it as much as others. Sometimes I find it hard to grasp certain concepts – whereas Johan did this really well! I Am Sleepless is like a new Fantastic Four or Ender’s Game!